Every now and then, we are asked by consumers on how to choose, select and buy a PoE for their IP cameras. The questions always go like this: How to select a PoE switch for my IP cameras? Should I go for or Gigabit PoE network switch for my IP security cameras? Do you have any recommendation on a PoE switch for over 4 IP cameras? So today, we share some insights and help consumers choose and select a suitable, reliable and best PoE switch for IP cameras. A PoE switch, simply put, provide power supply and data connection to power over Ethernet IP cameras via a single network/Ethernet cable (Cat 5, Cat 5e or Cat 6), similar to a PoE injector which normally supplies power and network connection to one IP camera. A PoE Switch normally comes with multiple ports to support more than two IP cameras. In such sense, a PoE switch provides power for all PoE devices, including IP cameras, computer, VoIP phone and other network-enabled devices. The question is how to choose or select a best PoE switch for your IP cameras. To choose a suitable, reliable and best PoE switch for your IP security cameras, there are few factors you need to consider: PoE standard, PoE IP cameras’ power consumption, PoE switch maximal power supply, PoE switch port number, cable length and etc. A PoE switch not only carries network connection but also supply power to Power over Ethernet (PoE) IP cameras. However, IP cameras power consumption varies; some could draw up to 20 Watt such as PTZ IP cameras RLC-423 while others could consume as little as 3 or 4 Watt. Therefore, a PoE switch should be able to provide enough power for different types of IP camera via Cat 5 or Cat 6 cables. There are mainly two types of power over Ethernet (PoE) standards, theoretically, the PoE standard (IEEE802.3af) could provide up to 15.4W of DC power on each port. In practice, only 12.95 W will be supplied to the IP cameras or other PoE devices given the power loss that dissipates in the network cables. Similarly, the PoE+ standard (IEEE802.3at) can pump out up to 30 W per port while only 25.5W could transmit to Network-enabled devices in real time. Choose a PoE Switch that suits your surveillance needs and makes sure to double check your PoE IP camera power consumption ether in the user manual or technical specification spreadsheet. Meanwhile, the maximal power supplies of your PoE switch matters as well. If the maximal power supply of the all your cameras exceeds your PoE switch power cap, then the PoE switch won’t provide enough power for all your PoE IP cameras, pan-tilt-zoom (PTZ) IP cameras in particular. Insufficient power supply to the IP cameras are the common culprits for video loss and IP camera poor performance. That being said, when buying a PoE switch for IP cameras, it’s important to go for a PoE switch with more power juice or reducing the number of PTZ IP cameras plugged into the PoE switch as PTZ cameras draw more power than other IP cameras. Many security cameras run either 12V or 24V power, if not supplied with the proper power voltage, the IP camera either won’t work or even be overloaded. For example, 12V IP security camera is powered by a 24V power source or vice versa, the IP cameras would likely to be burnt out or fried. 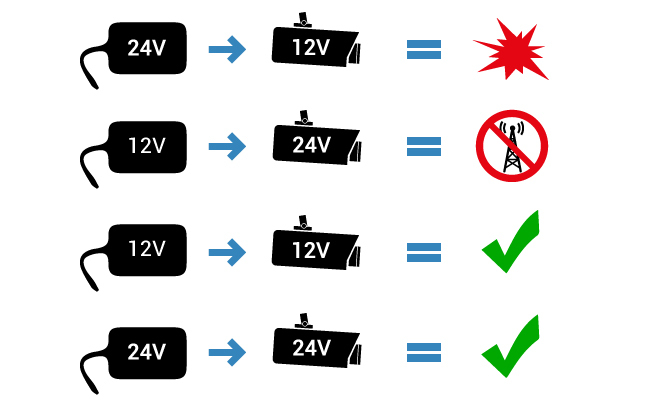 To provide the proper amount of power for the PoE IP cameras, one of an important feature to look for in a PoE switch for IP cameras is its abilities to automatically adjust voltage accordingly. For example, a PoE switch with 802.3af compatibility is able to accommodate the power input of your IP security cameras, for example, GS308P PoE Switch comes with IEEE 802.3af compliant. If you are looking for PoE switch for more than 4 cameras, it’s important to check the port number, such as a PoE switch with 8 ports, PoE switch with 16 ports, PoE switch with 24 ports, or PoE switch with 48 ports. While the port number largely depends on your actual need as well as the overall power consumption of your IP cameras. For example, a 24-port PoE switch with 370W power supply could power 24 IP cameras with IEEE802.3af standard (15.4W per port) while it could only power 12 IP cameras with IEEE802.3at standard (30W per port). As mentioned before, a PoE switch not only supply power to the IP cameras but also carries network connection. The main differences between an unmanaged and managed PoE switch lie in functionality, configurability, and of course, the price tag. Unmanaged PoE switch (cheaper) is a plug-and-play with no setup required while managed PoE switch allows you to configure networking protocols, as features such as VLANs, IGMP Snooping or more. For most homeowners, an unmanaged PoE switch fits the budget and works to meet the needs for powering PoE IP cameras. An NVR with built-in PoE switch not only spares users from all these relentless research, enabling users to plug their IP cameras into their NVR and forget it. 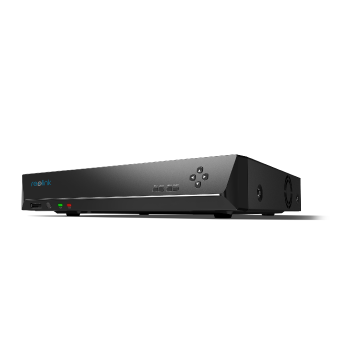 2TB Built-in HDD, Work with All Reolink 5MP/4MP Cameras for 24/7 Video Recording, Monitoring, and Management; Plug and Play. A reliable and right PoE switch goes a long way in providing enough power and network connection to your power over Ethernet IP cameras. Some best PoE switches for IP cameras like TP-Link TL-SG1008P 8-port Gigabit PoE switch and Netgear 8-port gigabit PoE switch are well-received and good for home and small business surveillance. This entry was posted in Buyer's Guide and tagged PoE cameras, PoE switch, power voltage. I want to put my NVR in a secure place to prevent a possible intruder from grabbing the NVR with him. Unfortunately, I cannot route the wires to that location. I wonder if I can connect all the cameras to POI switch, and then connect the switch to NVR with single cable? Yes you can once the NVR is PoE compatible.